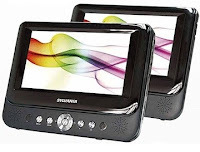 I read this twice to make sure I knew exactly what I was seeing - Get this portable dual-screen DVD player for just $50 plus $5 shipping. Yes, I said dual screens. The whole backseat gets to watch the show! Streaming videos is great and all, but what if you don't have Internet access? Let's say you're on the road and the kids are driving you crazy? What if you're camping in the woods and want to pass the time instead of, you know, talking? This retails for $100, and is $30 less than the next best price I could find online! Click here to see the deal at JustDeals.com.